Not impressed with FedEX. Not impressed at all. Why? Because they are having massive hassles delivering our rings! First off they reckon they have the wrong address. They don't. Then 3 days running they say they tried to deliver and no one was in, but that they had left a calling card. Granted on one of those occasions no on was in, but there was no calling card left - at all - and the other times mum was in, waiting. And today I get a message saying that the rings have been delivered and signed for. YESTERDAY. To an S. Later. Who signed for them. Meanwhile some lass on the FedEx phones is telling my mother that the rings will... WILL... be delivered tomorrow morning. 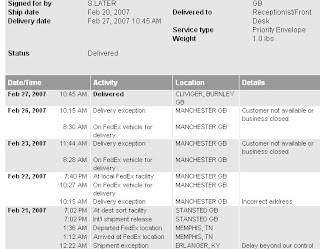 So.... why does the site say they have already been delivered to some S. Later punter??? Mum's been on the phone to FedEx, like I said, playing hell with them. Apparently the courier service FedEx have been using is being sacked anyway. And I've been on the email to the ring people in America letting them know what's going on because they have been asking me if we like the rings etc. When I told them what had happened they started to get on the phone to FedEx too. Question is... will they EVER arrive???? There's no blame on the lovely people who made the rings... but a POX on FedEx!! !